Tesla founder Elon Musk announced on Twitter that the company is launching a new mid-range version of its smallest EV, the Tesla Model 3. This is a new variant whose existence was so far kept under wraps completely. 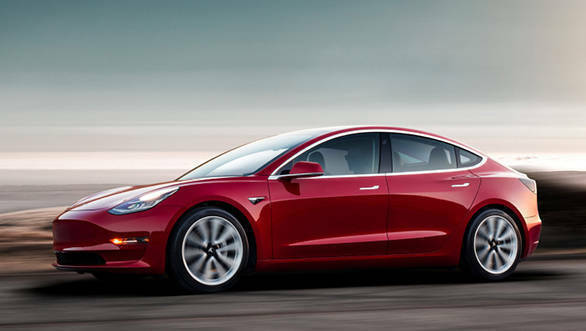 The launch of this new variant has also allowed Tesla to restructure the Model 3 line-up. The Long-range version will now only be available in a dual motor configuration while the mid-range version effectively replaces the single motor long-range version at a lower price point. The mid-range version will cost $45,000 as against the $49,000 of the earlier car. The base standard range version with its attractive $35,000 price tag is still four to six months away from launch. The Model 3 performance costs $54,000. The mid-range Model 3 is expected to come with a range of 418 km. This is about 80 km less than the 500 km range of the Performance version. The Standard version will see its range drop to 354 km. Tesla claims a sub-six second 0 to 96 kmph time for the Standard version, consequently, the mid-range version will at least equal or better that. But this will still be some way off the 3.3s acceleration figure that the top-spec dual-motor Performance version claims. With this restructuring of the Model 3 line-up, Tesla will be hoping to achieve, or at least get closer to, what it promised to do with the Model 3, to begin with. Make a Tesla that is affordable and can be a viable alternative to the usual crop of luxury mid-sized sedans.